cent of risk-weighted assets. 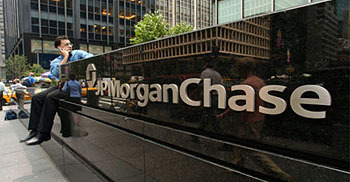 The biggest, including JPMorgan, have to reach 9.5 per cent. He objected to both the additional buffer of 2.5 per cent and the way capital is calculated. Mortgage-servicing rights, a US market feature which takes cashflow from homeowners paying mortgages, are strictly limited in counting towards tier one capital. Mr Dimon also criticised global liquidity rules, arguing that regulations that viewed covered bonds – a European market feature – as highly liquid but discounted government-backed mortgage-backed securities in the US were unfair and that other details hit investment banking activity core to US banks hardest. This stuff goes on endlessly because every country has a banking sector that specializes in certain things and not in others, and a business sector that relies on financing in one form but not another. When the dust settles, every country usually loses out on a few of its sacred cows. In our case, it was treatment of mortgage-backed securities. German banks got their way on covered bonds but are still upset over treatment of silent participations. French banks that rode out the financial crisis without problems are unhappy about getting stuck with the same rules as banks that didn’t. And of course, European banks in general are less well capitalized than American banks and are likely to have more problems with Basel’s core capital standards than ours. It’s possible that the U.S., on net, didn’t do as well as some other countries, but I doubt it. More likely, U.S. negotiators, for obvious reasons, wanted tough capital standards, wanted tough liquidity standards, wanted to rein in the use of mortgage-backed securities, and simply didn’t consider any of them an America-vs.-the-world issue. But then again, neither does Jamie Dimon. He considers it a JPMorgan-vs.-other-banks kind of issue — as well he should. His newfound sense of financial patriotism should be taken with a large shaker of salt.